By way of introduction to this WHY ME presentation, I feel a need to explain why I have not responded earlier in offering such a contribution. For several years as Lent came round, I have listened in St John’s church to various of my friends who have given WHY ME presentations, and have felt ashamed not to be willing to do so myself. This holding back on my part, I have endeavoured to justify as arising from a discretion, an awareness of mystery, of hidden truth. Certainly, that may be a genuine ground, and one calling for respect to be given to those held back on that account. But for me on my part, my holding-back is attributable to other less respectable grounds- to laziness, readiness to address other less-taxing issues, uneasiness to address conscience- troubling questions. So, curiously and with some surprise on my part, when in January this year Peter Wolton invited me to give a WHY ME talk, I found myself accepting in order to face up to these hesitancies. It has not been easy. I thank friends and my family who have helped me to prepare this ‘setting out’ of aspects of my belief. In this account I shall cover Origins of faith, Church going, and Content of belief. My family is middle class, protestant with my father much older than my mother from Northern Ireland. My mother was a committed member of the Church of England, though on her side there were members who practised the Catholic faith. I was brought up in the Protestant faith and regularly attended All Hallows Church, Cuckfield in Sussex. Later, when 12 years old I attended a boarding school It was initially located in Brighton, Sussex, but, on the fall of France was requisitioned by the Royal Navy, and the school moved to Keswick in Cumberland. On Sundays I attended church services in the 11th Century Anglican Church of Crosthwaite on the outskirts of Keswick. There, with the other girls from my school I sang in the choir, replacing choristers called up for military service, and learnt to ring the church bells. The bells during the war were muffled and only to be rung unmuffled in the event of an invasion. It was therefore a particularly memorable occasion when in 1941, I participated in a peel of bells which were unmuffled to celebrate, on the orders of Mr Churchill the Prime Minister, the victory of El Alamein.That was the first occasion I heard the sound of bells as we rang them. It is, in fact, true that one rings by sight rather than by ear or by hearing, by reference to the vision of the order in which the woolly ‘sally’ of the ropes to which the bells are attached are pulled down causing the bells to swing and the clapper to sound. A more fundamental challenge as to the rite which I practised on the occasion of my intended marriage, when my stepfather, my mother’s second husband, expressed opposition to the celebration of my marriage vows other than in the Protestant church. He was at the time a Lord Justice in the English Court of Appeal, a man of strong conviction: so great was his commitment that he arranged an interview with the Bishop of Chichester who similarly advised me that marriage vows were to be celebrated in a Protestant church. Meanwhile the clerics at Farm Street in London, urged with equal force that Michael, my intended, submit to the Catholic Rite. 1. Marriage in the Protestant Sussex church close to where we lived. 2. Baptism within weeks of birth in a Catholic Church of any children born to me. This solution meant that, at 4 weeks old, each of my four children was taken by taxi to the nearest Catholic church for baptism. In fact, of course, as parents, the decisions relating to our children as to which rite of faith should apply had a much more lasting effect in respect of their education and upbringing, and as to the children themselves, of their own subsequent choices relating to their ways of life. So I come to Church Going, the second part of my talk, to the Weekly Service and to ‘Life-changing’ Events. 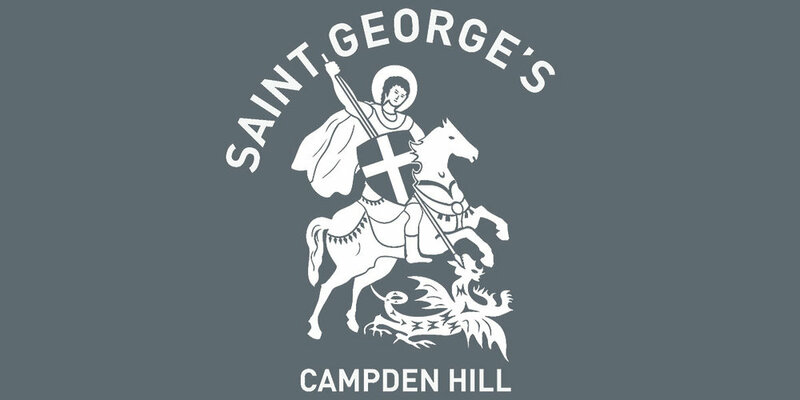 On coming to Notting Hill Gate in 1960 I regularly attended St George’s Church of Campden Hill, at that time a curacy of the historic St Mary Abbotts of Kensington. My attendance was derived from habit, became one of necessity, and led to a gap, a feeling of deficiency if missed. During the forty years or so of bringing up four children, teaching Law at University, with consequent sleeping one or two nights away from home, sitting as Chairman of a Juvenile Court in the East End of London, and later as a Director of a London-based International Law Institute, involving travel to many countries, I can best describe the regular service at St George’s, whether at 10am or the 8am early communion, as providing me with a refuge, a central point of reflection and a source of inspiration. In London today, the weekly service in protestant churches invariably takes the form of communion, the celebration of Bread and Wine; whereas in village churches in the countryside there will be services of Matins in the morning and Evensong in the evening which will include the singing of psalms, bible readings, and exhortation and response in prayers. These all play a significant part in the weekly service. This avoids, and would quieten my feeling of resistance with regard to the opening section of the Communion service which tends to rank the participant as a sinner and requires Confession and forgiveness before any further participation. My usual practice when in church is to liken myself to a pebble or grain of sand on the shore of a sea of infinity. ( In preparing this text for use in the parish website, however, I would wish to add ‘ one cannot avoid the fact that attendance at church generates a feeling of inadequacy and need for help). In addition to weekly church attendance I benefit from participation in life-changing events, often providing a strong religious element, a reminder of the passing of time, its ultimate ending and our own impending death. Christenings, weddings, funerals, and in a slightly different way, memorials services, with lives of special persons and theological sermons all contribute. I am enriched as a member of Lincolns Inn, a community of lawyers founded in the 14th Century, where John Donne, served as a preacher in the chapel before removing to be Dean at St Pauls. I must be honest, however, for throughout those years of weekly church attendance and life-changing events. I never abandoned my respect for the laws of nature, scientific reasoning, abstract human intelligence; with consequent questioning whether events can be achieved by prayer alone. As to the purpose of this stirring of conscience Phillip Larkin in his poem ‘Church Going’ expresses, well, in my view, the ‘pull’ of worship in a church. I think he uses that archaic word “Blent” to indicate how our compulsions get confused, mixed up. Finally, I come to my third part, and here I try to follow the prayer of St Theresa of Avila. “The important thing is not to think much but to Love much, and so do that which best stirs you to Love”. Recently, with my increasing physical impediments, I have found her words to be true and found, in areas I formally scorned, overlooked or despised, a significant warmth of heart and understanding.